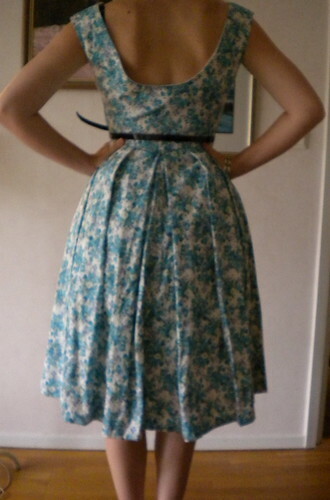 Best of all was that I had an excuse to make an over-the-top fifties dress, and be able to wear it! Yey!!! It´s obvious from the photos, I see this now, that I should have adjusted the waist a bit – see where my belt is, and where the seam is? But when I made it I had more concerns with the closing. Originally this pattern calls for bound buttonholes. I don´t have the fabulous tool everybody is talking about, and I have never made bound buttonholes before either. I tried making some from scraps, but soon understood that there was NO WAY I would be able to make nine (!) buttonholes on a straight line…Soo, my fantastic mother suggested I make the closing that you see in the pictures. It´s just loops of satin cord sewn onto the facing. This, off course gave me some other concerns, as the whole thing didn´t come out symmetrical. The buttons are 1,5 cm to the right of the middle. But, at that point, I just ignored it and made it work. I am very happy with the result, though! This is a pattern I have been wanting to try for a long time, and when I found this fabric I knew they were the perfect team! This dress is marked Easy on the envelope, how it´s possible to say that a dress with a million pieces, bound buttonholes and a fitted bodice is easy, is more that I can understand, but it is really fun to sew up with you have a bit more experience! 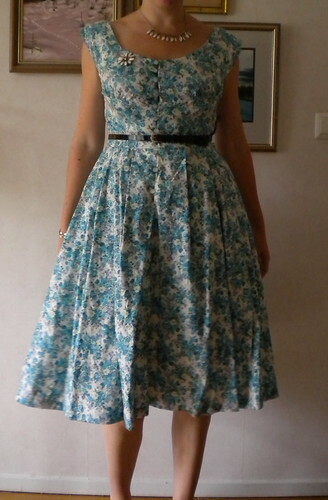 OK, so that´s the last summer dress for the year – I promise! That dress came out beautiful! 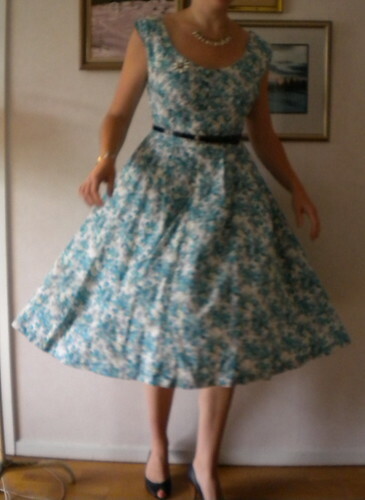 I’ve been debating on making this dress for a Pin-Up Girl style calendar photo shoot that we’re doing for a charity. Now that I’ve seen the dress made, I think I’ll give it a go. What a lovely dress, especially the back and the fabric is wonderful. Hälsningar från en annan syentusiast från Uppsala! Wow… I adore that fabric!… and that brooch is amazing. Ohmygoodness….my grandma had a dress that looked just like that. I remember it perfectly. It’s lovely!! Your dress is truly stunning. 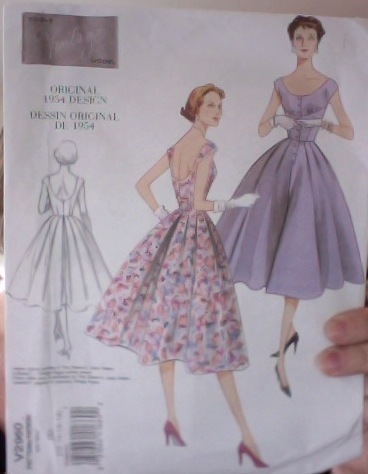 I have ordered a few vintage Vogue patterns but as a novice sewer they make me very very nervous!! Lovely, lovely! Your jewellery is awesome! @Samantha: Kul! Jag köpte tyget på Ohlssons tyger i Stockholm! 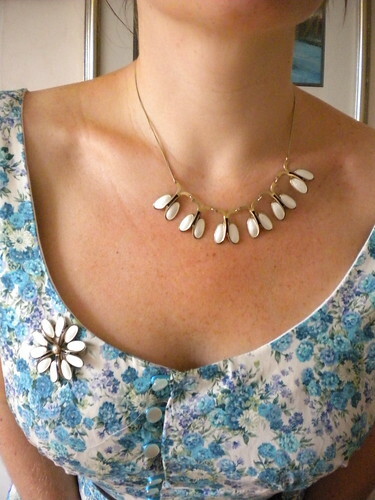 @Alana and Sarah: The jewellery was my great-grandmothers. I´m so happy to be able to use it from time to time. Erica B: Thanks, the good thing about this pattern is that it has quite clear instructions, so just take your time and have fun with it! Super cute! You did a great job! I want this dress, or at least the pattern! LOVE! I love your dress – and great job on the buttons! I have this pattern and am thinking about making it – glad you did it!! the dress and the fabric are so yummy – what a dreamy look – congratulations! So pretty! I have this pattern but haven’t made it up yet. I love the loop closure as a nice sneaky way to avoid the bound buttonholes, hehe. The fabric is just perfect for this dress too!